There was a time in my 20’s when I was an Advertising Account Executive (isn’t that a great title?) for several radio stations. I really enjoyed working with clients to develop advertising campaigns and was very successful. The radio stations I worked with were either rural stations that didn’t subscribe to audience measurement services like the Bureau of Broadcast Measurement, or metro stations that had older audience demographics. At the metro area stations it was difficult to sell advertising to many clients because they believed that the audience they wanted to talk to were adults (or specifically women) between the ages of 18 and 49. What was interesting about this demographic demand was that when you looked at the individuals actually shopping and buying in these businesses they were often older than 49. Because many of these firms offered special discounts to customers over 55, it was possible to track sales (to a limited degree) to this demographic group. In many cases these customers would account for at least a third of all sales. Even in the face of this reality, the clients would still insist that they only wanted to reach customers between the ages of 18 to 49. Clients believed that this audience had more disposable income to spend. Even though I had anecdotal evidence to the contrary, the clients dismissed the information. Because of these experiences, I was delighted when I heard the episode titled Ageism in Advertising during the fifth season of Terry O’Reilly’s The Age of Persuasion on CBC Radio One. This episode originally aired on May 28th, 2011. For the past 30 years, the advertising industry has worshipped at the altar of youth – because people 18 to 49 have the most disposable income. There’s only one small problem with that – it isn’t true. People 55+ spend the most money in almost all categories. They buy the most cars, spend the most on electronics, and control the most wealth. Yet advertisers aren’t chasing them. Join us this week, as we try and figure out why a touch of gray keeps advertisers away. You can listen to the episode (or download it) here. It is about 27 minutes long and well worth listening to in it’s entirety. Why I’m writing about this episode isn’t so much about personal vindication (although, to be honest, there is some of that). Rather it is to show that myths can blind us to what is really in our best interests. My clients could see and document that at least a third of their sales were being made by customers over 55 and yet they refused to act on this information to increase the success of their businesses. There are other examples of this type of blindness to the real situation. In the aviation world one adage states “the average life expectancy of a novice pilot flying into clouds is about 30 seconds.” This is because the novice pilot loses sight of the ground and then refuses to believe what the aircraft’s instruments are telling him, believing instead what his body is feeling. This disorientation leads the pilot to make errors that cause the plane to crash. The Top 10 Pilot Errors article from Plane & Pilot will give you more information on this type of error. What myths are we blinded by when we work in public libraries? Do we doubt the evidence that we can easily collect, in order to chase after a story we wish to be true? Do we test our beliefs empirically or do we follow myths? 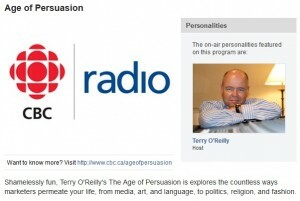 This entry was posted in Advertising, History, Public Libraries and tagged 18 to 49 demographic, Age of Persuasion, CBC Radio, Terry O'Reilly. Bookmark the permalink.